Sales of aluminum fishing boats began to climb again in November and the largest category of fiberglass boats also saw a gain as the industry’s main powerboat segments showed 1.5 percent growth for the month. Sales of fishing boats rose 5.6 percent in November, to 787 boats, compared with the same month a year earlier, and sales in the high-volume 11- to 40-foot outboard fiberglass segment were up 3.5 percent, to 1,047 boats, according to figures compiled by Aarn Rosen, national marine sales manager at Statistical Surveys Inc. Together the two categories helped to lift total sales in the main powerboat segments to 2,458 boats during what is traditionally the second- lowest month for volume in the industry. November sales typically represent 2 to 2.7 percent of the year’s total retail activity; December is typically the slowest month of the year. The sales information for November is based on registration data from 26 early-reporting states, or about 62 percent of the nation’s boat market. Reports of sales of documented vessels were incomplete because of data entry delays at the Coast Guard. For the year through November, sales in the 11- to 40-foot outboard fiberglass segment are up 3.5 percent, to 22,558 boats, and sales in the main powerboat segments are up 2.4 percent, to 73,148 boats. Sales of aluminum pontoon boats are up 9.8 percent for the year, to 15,102 boats, despite a drop in November of 2.4 percent, to 247 boats. Sales of aluminum fishing boats are up 5.7 percent for the year, to 18,853 boats. 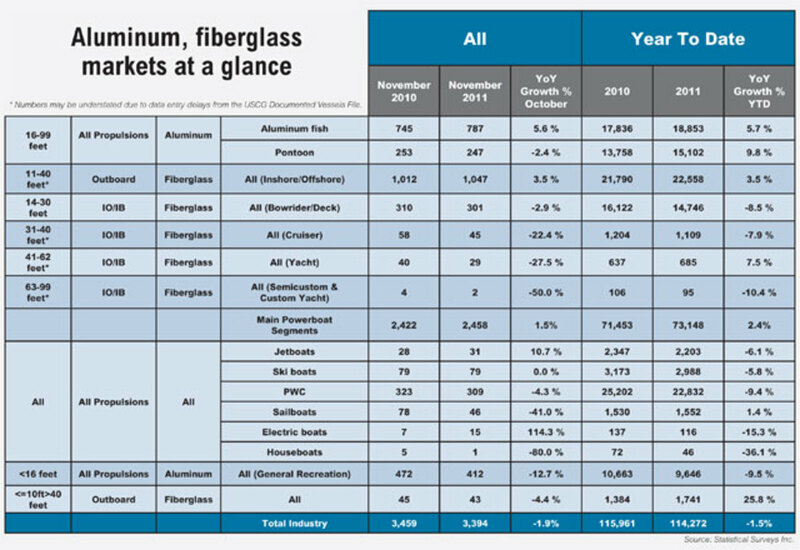 Sales in the two aluminum-boat categories have helped to buoy the industry amid the lengthy slump in fiberglass sales. Industrywide sales fell 1.9 percent for the month, to 3,394 boats. Through November, across-the-board sales were 1.5 percent lower than in 2010, at 114,272 boats. Sales of outboard fiberglass boats of 10 feet or less and greater than 40 feet fell 4.4 percent in November, to 43 boats, but for the year to date sales in the category are 25.8 percent higher, at 1,741 boats. Sales of all fiberglass boats, including personal watercraft, fell 2.6 percent for the month, from 1,999 units to 1,948. For the year through November, sales are down 4.1 percent, from 73,704 units in 2010 to 70,671 this year. Sales in the core 14- to 30-foot fiberglass segment fell 2.9 percent, to 301 boats, in November, and are 8.5 percent lower, at 14,746 boats, for the year. Sales of personal watercraft fell 4.3 percent, to 309 units, in November, and are 9.4 percent lower, at 22,832 units, for the year to date. Sailboat sales fell 41 percent in November, to 46 boats, but they are 1.4 percent higher for the year, at 1,552 boats.